13 and 20 August (Saturday), 3 – 5 p.m.
(P100 adults, P50 students, P25 children and seniors)Our popular series of Saturday lectures on Jose Rizal continues, with our August talks looking into the Knights of Rizal and the National Hero’s concept of Filipino nationhood. Both lectures come with museum admission (P100 for adults, P50 for students, and P25 for children and senior citizens). Advance registration is recommended. To register, call 889-1234 or email info@yuchengcomuseum.org. Yuchengco Museum is located at RCBC Plaza, Corner Ayala and Sen. Gil J. Puyat Avenues, Makati City. Justice Justo Torres, Jr.Learn more about the Order of the Knights of Rizal, its history, its organizational structure and worldwide chapters, and its recent activities. Justice Justo Torres, Jr. is the Supreme Commander Emeritus of the Order of the Knights of Rizal, a fraternal organization that honors and upholds the ideals of the National Hero. A retired Associate Justice of the Court of the Appeals and the Supreme Court, Justice Torres is also the Vice President of the Cavite Historical Society and an official of the Philippine Judicial Academy. Paul DumolJoin professor and playwright Paul Dumol in a discussion on Jose Rizal’s contribution to the building of Filipino nationhood. Aside from teaching at the Department of History at the University of Asia and the Pacific, Paul Dumol is a playwright best known for his works Ang Paglilitis ni Mang Serapio. His plays have been exceedingly on historical subjects, particularly Philippine heroes of the end of the 19th century. The Rizal Lecture Series is one of the highlights of the RIZALizing the Future exhibit at Yuchengco Museum, on view from 3 June to 29 October 2011. 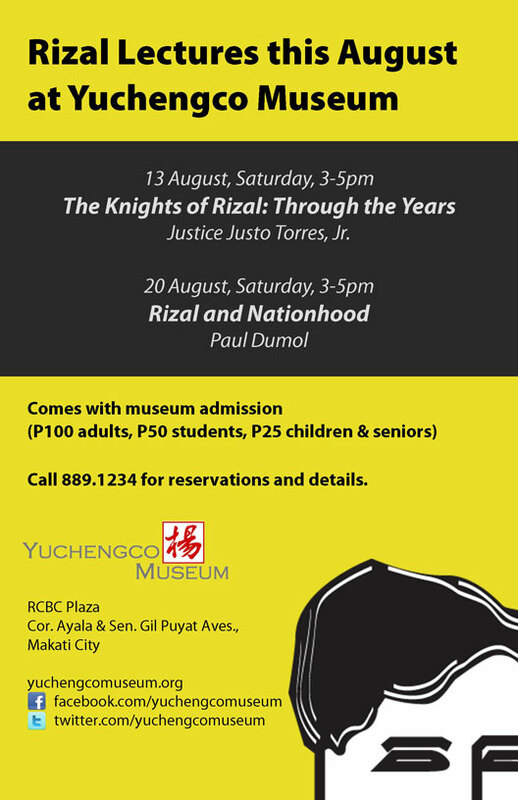 For more details, visithttp://www.yuchengcomuseum.org/rizalizing.html.